Toyota surely has learned to turn the tables in its favor by producing some really striking designs for the new generation of their previously boring looking cars. The Camry is one perfect example of this notion, as the drab and conventional looks have made way for a really swanky looking model, which makes it look futuristic. The wide curvy front fascia and the long silhouette generate an impression of a sedan from one segment above, in the favor of Camry. Even the interior cabin looks no more conventional and lacking in terms of features, as there is a drastic improvement in terms of layout and list of kit on offer. 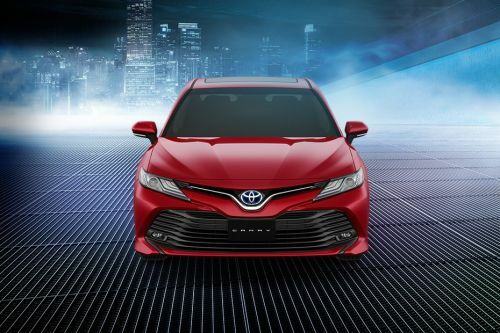 The only powertrain Toyota has made for the Camry is a 2.5-litre four-cylinder petrol engine, which is mated to a CVT gearbox and produces a maximum power output of 184 PS and a peak torque output of 235 Nm. Have a question on Camry? Camry is available in 5 different colors - Silver Metallic, Red Mica, Burning Black, Platinum White Pearl and Graphite Metallic. The Toyota Camry needs no introduction, for the car has been one of the most successful models from Toyota across the globe. Obviously, after its number one selling car, the Corolla. The executive sedan from Toyota has seen a number of changes in its entire life span which started back in 1979 as Celica Camry. Since then, the Toyota Camry has set its footprint in many markets, with the Asian ones being at the topmost priority. It also needs a special mention that it is the Toyota Camry which has been one of the very successful pioneers in hybrid culture. In the Malaysian market, however, the Toyota Camry sold currently is the previous generation model which has been replaced by an all-new generation in many markets now. In Malaysia, the Camry is available in a total of two variants – E and GX. Both the trims are sold with a sole engine option of a 2.0-litre petrol mill mated to a 6-speed automatic transmission. The sedan is being offered in five color options – Attitude Black, Silver Metallic, Medium Silver Metallic, Gray Metallic, and White Pearl. On the insides too, the Toyota Camry has nothing much to praises for, as the cabin has been styled in a very simplistic manner. However, one could not find any fault in the levels of sophistication and comfort this cabin provides. The four-spoke steering wheel has been restyled with different buttons for audio and telephony, and come with aluminium inserts giving it a look premium. The instrument console, with colored MID screen, is probably the only cool bit one would find in this otherwise plain-jane cabin. The center console is the most heavily styled bit of this cabin, with the mix of fake wood and aluminium inserts and number of buttons making it looks plush. However, the overdose of buttons for climate control might look confusing to one and look slightly archaic. The touchscreen music system too misses out on modern bits like Android Auto and Apple Carplay, which are a big miss in the Camry, considering the price bracket it falls in. The Camry is otherwise adequately equipped with features like cruise control, tilt and telescopic adjustable steering, push-button start with keyless entry, leather upholstery, wireless charging, rear sunshade, and rain sensing wipers. However, given its premium price positioning, it feels lacking in many more comfort and convenience features. One area where it genuinely succeeds in is the way it feels. The comfort levels are high with electric adjustments for all the seats at both front and rear. Complementing it is the generous amount of space it offers, the Camry feels very comfortable. The Toyota Camry has always been that one car which remains straight to the point with its no-nonsense looks that makes it look simple, yet elegant. The Camry sold in Malaysia is based on the last generation model, which looks too plain and slightly dated. The all-new generation model sold currently in other developed markets, however, carries modern style tweaks. At the front, the Toyota Camry has got a plain looking grille which gets a thick slat of chrome at its upper portion. This setup ends up at the angular headlamps that come along with inbuilt with HID projector and daytime running LEDs. The front bumper comes with unique placements for fog lamps, which are situated at the lower end corners of the grille, and are enclosed in chrome garnishes. From the sides, the Camry looks too bland for anyone’s liking, with literally no character lines or curves to make it look interesting. Thus making the side profile look very boring in isolation. The waistline chrome finish and door handles add some character to the otherwise bland side profile. At the rear, the Camry carries forward the simplistic approach in its design with large tail lamps at both the sides connected with a thin strip of chrome, which does look elegant. The Toyota Camry comes with the conventional suspension setup of MacPherson strut type with stabilizer at the front. At the rear, this duty is performed by dual-link independent strut type with stabilizer. The suspension on the Camry has been tuned on the softer side to make it feel as comfortable and jerk-free as possible. The large 17-inch alloy wheels too aid much for that matter. And for a car which measures almost 4850 mm in length, the low turning radius of 5.5 m is really commendable. All these features make it quite easily manoeuver under traffic conditions, despite its large size. The Toyota Camry for the Malaysia market is available with the sole option of a 2.0-litre, four cylinders, petrol engine. The engine is capable of putting up 167 PS of power and 203 Nm of torque. The engine is mated to a 6-speed automatic transmission for a seamless driving experience. As expected from a Toyota powertrain, the engine feels vibration free and refined throughout the rev range and is almost silent when idle. For the Malaysian market, the Camry is available with a plethora of safety aids like the front, side, curtain and knee airbags, front and rear parking sensors, ABS with EBD and BA, vehicle stability control, hill start assist control, traction control, parking sensors, and ISOFIX mounts. For those who feel that their car should be up-to-date with futuristic styling, next-gen features and equipment, the Toyota Camry is a car they should avoid. The car feels slightly dated in today’s day and age in terms of looks and features. Also, it is quite understandable, considering the fact that this very model has been replaced globally with an all-new generation version, which is much swankier than this Camry sold in Malaysia. However, one could not avoid the comfort level and premium feel on the inside which this Camry gives. The Toyota Camry still makes some sense, considering the lack of options in the mid-size hybrid sedan segment. What are the Safety Features Available in Toyota Camry? 2019 Toyota Camry: What to expect?